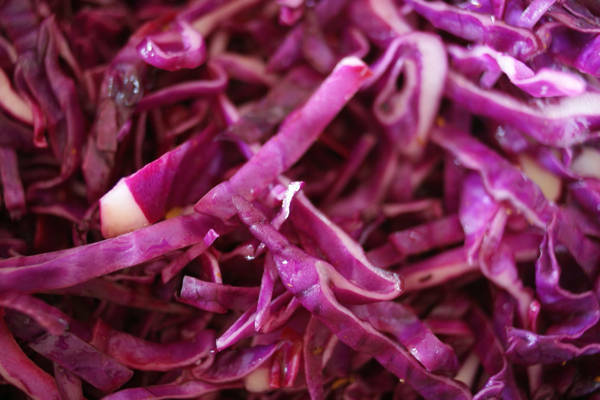 I am a little obsessed with re-creating the shredded red cabbage that comes with kebabs. I’ve been scouring the interweb in my attempts to turn what can be a very dull vegetable (unless braised with red wine) into the moreish delight that I so love alongside a tender chicken shish kebab. I’m not one of those late night eaters, that having drunk more than is physically necessary then get the hunger that only a greasy doner kebab can stop. I haven’t actually eaten a doner kebab since a very drunken night at Uni and the cold, semi-glutinous mass that was congealing on the side when I awoke the next morning was the very last time that reformed meat sliced from a revolving spit passed my lips. 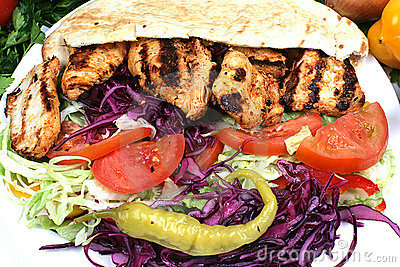 A good chicken shish however is actually a very healthy option. Consisting of a pita bread, some grilled chicken (how very lean and healthy) with copious amounts of salad and my other favourite, sour sweet chillies. When I first tried the one local to my boyfriend’s parents I was in love. The shredded red cabbage with the chillies sang to me as they made their way into my mouth. Unless you’ve tried it there is no real way of describing it. There is something about the way they shred it and season with what I can only guess at as salt, oil, lemon juice and possibly some kind of sugar. The chillies are crisp and fresh with a lovely tangy sourness to them. I’m lucky to have found a local takeaway that does sell them as extras so I generally order a couple of tubs. The cabbage however alludes me. So far not one of the local takeaways has given me this shredded cabbage with my meal, I’ve tried traditional Turkish, Lebanese, your high street kebab place. None have it in their salad. I am forced to make it myself. All I have discovered is that the cabbage should be shredded as thin as possible, then kinda scrunched or wringed as such. Then a little salt and lemon juice sprinkled over. Perhaps they rinse it afterwards. I’m not sure to be honest. The one time it came out good close I didn’t make enough and since then I have failed to get that close again. This recipe here is possibly the closest I can find to how to make authentic Turkish cabbage. I know it’s not something I should get hung up about but trust me, if you ever get hooked on a flavour you cannot then get again you will try anything to re-create it. Is there anything you’ve tasted that you wish you make yourself? Thanks for the tips, been scouring the web on how to make both this and the ‘unique to kebab shops’ chilli sauce.